If you’re a longtime iPhone user then Mujjo is a name you’re almost certainly familiar with. Apple’s own leather iPhone cases are great if you’re just looking to lazily grab something while you’re at an Apple store, but Mujjo’s leather cases are a cut above the rest. They use better quality leather than Apple, they’re available in colors that are more sophisticated than Apple’s, and now they’re finally available for the new iPhone XS and iPhone XS Max. There are four different models listed below and each one is available in four different colors. Definitely check them out. 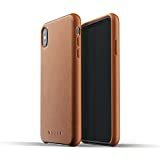 MUJJO’S BEST LEATHER CASE for IPHONE XS / X – Full leather wrapped case profile with Mujjo’s signature full-grain vegetable tanned leather. Get complete body protection for your IPHONE XS / X. Available in Black, Grey, Olive & Tan colors. UNDERSTATED CRAFTSMANSHIP, EVERY DETAIL CONSIDERED – Button profile designed & tested for responsiveness and ease of use. Each button is covered in leather that adds sleekness to overall design. Effortlessly mute & charge your iPhone while it’s protected. Open access to speakers, lightning connector & camera. FULL LEATHER WRAPPED PROFILE, SCREEN EDGE PROTECTED – Made out of Mujjo’s signature premium quality leather. Super slim profile accentuates iPhone’s beautiful design. Leather rises 1mm above edge of the glass creating a raised bezel to protect your screen. LUXURIOUS FULL GRAIN LEATHER – Soft to touch tanned leather that breaks in & acquires unique patina. Rich color enhanced with aniline oil treatment. Satin-like interior lined with finest Japanese microfiber. MUJJO IPHONE XS / X CASE – Mujjo is the creator of world’s first leather phone case. Praised in Forbes, New York Times, Harper’s Bazaar. Perfect gift for any occasion. Retail packaging. 2-year factory warranty. MUJJO’S BEST LEATHER WALLET CASE for IPHONE XS / X – Integrated card pocket holds 2-3 cards. Full leather wrapped case profile with Mujjo’s signature full-grain vegetable tanned leather. Get complete body protection for your iPhone X. Available in Black, Gray, Olive & Tan colors. COMBINE DAILY ESSENTIALS, UNDERSTATED CRAFTSMANSHIP, EVERY DETAIL CONSIDERED – Leather pocket fits 3 ID or bank cards. Protects & eliminates bulky pockets. Optimized button profile. Take pictures, make calls & charge your iPhone while it’s still protected. MUJJO IPHONE XS / X CASE – Mujjo is the creator of world’s first leather wallet case. Praised in Forbes, New York Times, Harper’s Bazaar. Perfect gift for any occasion. Retail packaging. 2 year factory warranty. 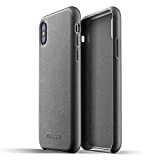 MUJJO’S SLIMMEST PROTECTIVE LEATHER CASE for IPHONE XS MAX – Protective case for Apple iPhone XS Max wrapped in Mujjo’s signature leather. Praised in Forbes, New York Times, Harper’s Bazaar. Perfect every day case or gift for any occasion. Retail packaging. GIVE iPHONE XS MAX PROTECTION with UNIQUE STYLE – Super slim profile accentuates iPhone’s beautiful design. Full leather wrapped case guards body from falls. No edges exposed, complete drop protection against damage. 1mm raised bezel protects screen from shattering. UNDERSTATED CRAFTSMANSHIP, EVERY DETAIL CONSIDERED – Case fully wrapped in premium leather. Each button covered in leather and optimized for responsiveness. Camera opening and mute button feature a leather chamfer that subtly curves inwards. ORGANICALLY AGING, NATURAL TANNED LEATHER – Soft to touch, vegetable tanned leather breaks in & ages with a unique look. Case interior lined with finest microfiber from Japan giving satin-like padding for you iPhone XS Max. Rich colors enhanced with aniline oil treatment. ACCESS CAMERA, BUTTONS, PORTS & WIRELESS CHARGING – Take pictures, make calls & use wired / wireless charger on your iPhone XS Max while it’s protected. Available in Black, Blue, Olive & Tan. 2 year factory warranty against defects. 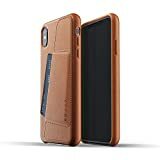 MUJJO’S BEST PROTECTIVE LEATHER CASE with A CARD WALLET – Protective case for Apple iPhone XS Max wrapped in Mujjo’s signature leather. Leather card pocket holds 2-3 cards. Praised in Forbes, New York Times, Harper’s Bazaar. Perfect every day case or gift for any occasion. Retail packaging. NO MORE BULKY POCKETS. LEAVE YOUR WALLET AT HOME – Combine daily essentials with your Mujjo case for iPhone XS Max. Carry up to 3 cards in your phone’s wallet pocket. Ideal for ID, access, commuter & credit cards.